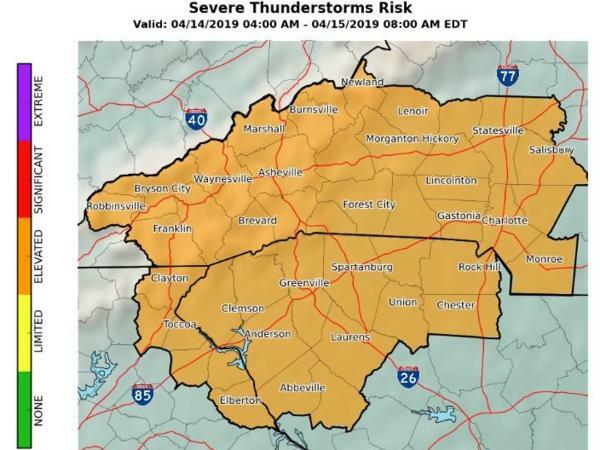 Severe storms are expected to move through the Charlotte area Sunday afternoon. Stormy spring weather is likely in the Charlotte region later today. Meteorologist Scott Krentz with the National Weather Service said an approaching cold front could trigger severe weather, with "pretty strong" storms moving across the area around 2 p.m. and 3 p.m.
"We could have some strong winds and some large hail," Krentz said. He added that the strong storms could start rotating. "The rotating storms certainly can produce tornadoes as well," he said. The National Weather Service has issued a tornado watch for Mecklenburg and its surrounding counties, including Iredell, Rowan, Gaston and Lincoln until 8 p.m. There's a tornado watch issued for over much of upstate South Carolina. 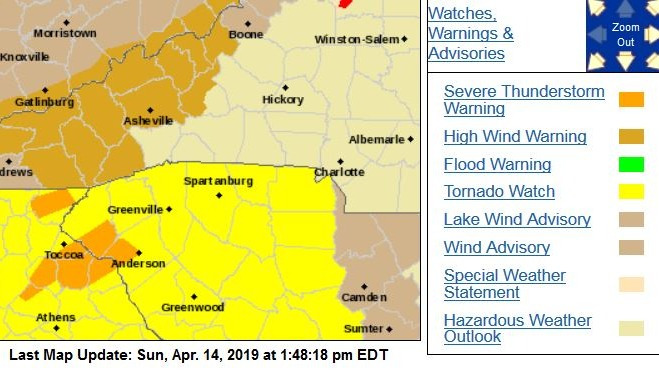 There's a tornado watch for much of upstate South Carolina, including York and Chester counties, until 7 p.m.
Today's storms follow severe weather yesterday. Hail and high winds were reported around Morganton. Heavy rainfall moved across upstate South Carolina, flooding roads in York County. Krentz said with the ground saturated from yesterday's rainfall, isolated flash flooding is also a possibility in the Charlotte area throughout the day. This is a developing story. Check back in for severe weather updates.